Spray it with vinegar. Mildew on grouting is no match for the miracle household cleaning dynamo that is vinegar. Pour some white vinegar into a container, dip in an old toothbrush and scrub the mildew. Or pour the vinegar into a spray bottle, squirt it onto the mildew and let it sit for 10 minutes. Rinse with water and scrub with the toothbrush if necessary. Spray it with a bleach solution. Bleach is also effective in removing mildew from grouting. Fill a spray bottle with equal parts of household bleach and water. Spray the grouting. Let it sit for a few minutes and then wipe with a clean white cotton cloth. You can also use commercial quality paste grout cleaners but avoid pumice stones - using them takes far too much time and removes far too little mildew from the grout. Stain the grout using a grout colourant. Old white grout that has turned brown is nearly impossible to clean. Even bleach or specialist tile grout cleaning products sometimes can't remove all the soaked-in dirt. And regrouting the joints is messy, labour-intensive work. The time saving solution is to use a grout colourant, available in most DIY stores, which will give glazed tiles a new look. Make sure the tiles and grout lines are completely clean - if necessary, use a limescale remover - and dry. Use the brush applicator provided to spread the grout colourant generously over the grout lines overlapping the tiles. Leave for at least an hour (check instructions) and then use a clean sponge to wipe any excess colourant off the face of the glazed tiles. Coat the mirror with glycerine. After a warm shower or bath, you probably wipe off the mirror with a towel, but it just steams up again within seconds. Try this quick solution: when you clean the bathroom, wipe a little glycerine (available at chemists and some hardware stores) on to the bathroom mirror. Buff it lightly with a soft cloth. The thin coating of glycerine will prevent the glass from fogging and will last about a week. It will need doing more often if you have a lot of people taking showers. Keep the mirror lint free. A lot of the materials used to clean mirrors such as cloths and paper towels tend to leave lint behind. Try using paper coffee filters instead. They make excellent cleaners for glass surfaces and mirrors because they leave no streaks or smudges. Wash it off with a bleach solution. Some shower curtains can be tricky to clean because they are big and cumbersome. Getting rid of mildew, especially during damp weather can be especially challenging. Here is a solution that's quick, easy and low-cost. Pour 4 litres of warm water and 100ml of household bleach into a plastic bucket. Wearing rubber gloves, soak a sponge in the solution, giving it a squeeze to avoid drips and then wipe. The mildew will vanish. Rinse using a showerhead. Ready to throw away a mouldy shower curtain? Throw it in the washing machine. Don't throw away a polyester or nylon curtain liner just because it's covered in mildew or dirt. You can extend it's life by cleaning it in your washing machine. Set the machine on the gentle cycle with warm water and 200ml of washing detergent or 100ml of vinegar. If you have a tumble drier, spin it for 20 minutes on the lowest heat and it will come out clean and wrinkle free. Or hang it on the line to dry in the breeze. Afterwards, rehang it immediately. Clean them with vinegar, bicarbonate of soda and salt. Stubborn mineral build-up on glass shower doors or screens is no competition for a few common household ingredients. White vinegar, bicarbonate of soda and salt. Spray vinegar on the to the door or screen and let it sit for a few minutes. Next, create a paste using equal amounts of bicarbonate of soda and salt. Use a damp sponge to rub the paste over the door then rinse well. Preventing scum on shower doors. Cleaning soap scum off a shower door is a time-consuming, tough job. Once your doors are clean, others recommend following up by using lemon oil furniture polish as a barrier against a future build-up of scum. Wipe it with furniture oil on a soft rag. Let the oil sit for two minutes and then polish off the excess with a dry cloth. The furniture polish will leave a slight film of oil that will act as a barrier against future soap scum. Using a shower squeegee after every shower will also discourage the build-up of scum. Use an old toothbrush. It's is the perfect time-saving bathroom cleaning tool. You can use it to clean the tracks of a shower's sliding glass doors. Simply spray bathroom cleaner on a paper towel and wrap the towel around the bristle end of the toothbrush. Then push the brush along the tracks to dislodge dirt. Or put the bristles to work on the grime that collects around the rim of a bathroom sink or at the bottom of taps. Once the bristles have loosened any dirt, just mop it up with a damp sponge. Use an overnight vinegar wrap. No one likes crusty white deposits on a tap. Try this easy solution. Before you go to bed at night, take a bottle of white vinegar and three paper towels. Saturate the paper towels in the white vinegar and wrap them around the tap like a cacoon. In the morning, remove the paper towels. Fill the basin with warm water plus a squirt of washing up liquid. Dip an old toothbrush in the solution and scrub the tap to remove the final bits of mineral deposit. Make a template to guide you. Cutting carpet in a bathroom is very difficult. If you cannot afford a professional to do this for you, then make a template. When cutting new carpet you need to get it right first time. Cutting carpet is particularly tricky in a bathroom because of the curves shape of the toilet base and basin pedestal, or the od shapes of bathroom cupboards. The secret is to make a paper template first. Buy a large roll of lining paper from a DIY store. You'll also need scissors, a ruler, sticky tape and a pencil. Start by placing a sheet of paper on the trickiest part of the floor. Trace and cut the paper to fit that area. Leave it there. Go on to other sections of the bathroom floor until you have covered it all. With all the paper sections in place on the floor, tape them together and check that the fit is perfect. Remove the entire template and lay it over the carpet as a guide for cutting. Lino can be cut using the same technique however, ideally, it should be fitted underneath a toilet pan and basin pedestal. This is even more important when using floor tiles. 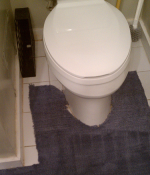 Not only will you avoid mistakes or unsightly gaps, but when it comes to replacing your toilet pan or basin pedestal, you won't need to pay for new flooring too.